Still Haven’t Made the Switch to Reusable Bags? There are many reasons why you should #GoReusableNow and switch to reusable shopping bags. Between the negative impacts of disposable plastic bags and the advantages of reusable bags the choice is pretty clear, but we’ve rounded up 20 reasons why you should go reusable now. Single-use plastic bags are not biodegradable. Rather when exposed to the elements they photo degrade which means they break apart into smaller pieces of plastic and effectively become even more difficult to clean up. Per a study conducted by the Wall Street Journal, only 1 percent of disposable plastic bags are recycled worldwide. In the U.S. the recycling rate of plastic bags is about 11 percent. The bags that are not recycled are left in landfills or as litter. Disposable plastic bags can be recycled – they’re just not. Lack of information and availability of collection bins are thought to be the reasons for the low recycling rates. Millions of dollars in taxpayer money is spent each year picking up disposable plastic bag litter. When plastic bag debris is not cleaned up it is either an eyesore or it can become lodged in storm drains, resulting in flooding and damage to homes and businesses. Many stores, particularly larger grocery stores and supermarkets, accept single-use plastic bags for recycling. Some states even mandate stores over a certain square footage of retail space accept plastic bags for recycling. Look for a plastic bag recycling bin near the front of the store. The U.S. uses approximately 100 billion new plastic bags per year. The average American uses between 350 and 500 single-use plastic bags. Due to their lightweight construction disposable plastic bags are the debris most likely to carried by the wind and fly away from landfills. Once airborne plastic bags normally to settle in trees, storm drains, beaches or the ocean. Single-use plastic bags make up over 10 percent of the washed-up debris polluting U.S. coastlines. According to the British Antarctic Survey, discarded disposable plastic bags have been found as far north as the Arctic Circle and as far south as The Falkland Islands. By some estimates one million birds and 100,000 turtles and other sea animals die from ingesting single-use plastic bags. The bags block the animal’s digestive tract and they starve to death. Single-use plastic bags can be deadly for animals even if not ingested. If an animal becomes tangled in a disposable plastic bag they may be unable to fend for themselves or defend themselves from predators. Disposable plastic bags are made from non-renewable resources, petroleum and natural gas. Up to 12 million barrels of oil are used to manufacture the amount of disposable plastic bags used in the U.S. each year. In 2002 Ireland levied a tax on disposable plastic bags, and as a result usage has decreased by 90 percent, which works out to about 1.08 billion plastic bags that were not needed. In recent years dozens of countries have banned or implemented a tax on disposable plastic bags. Reusable shopping bags come in an almost endless variety of sizes, shapes and prints, so you can find something that is comfortable and functional for you to use. Some grocery stores offer shoppers a discount for each reusable grocery bag they bring. The discount is usually 5- to 10-cents per reusable bag, but that savings can add up over time. 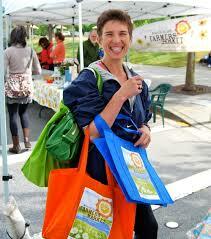 The average reusable bag has the lifespan of about 3 – 6 years and works out to over 700 single-use plastic bags. A worn out reusable shopping bag made from recycled or sustainable materials can be recycled, composted or safely thrown in a landfill and cause no environmental harm. If your company would like to be a part of the solution to the plastic bag problem, please reach out to us here to create a custom reusable bag for your marketing.